WO2 Aran Stowey of The Queens Household Cavalry based in Windsor, Berkshire was put in charge of organizing their Christmas Ball. He contacted us regarding their Christmas theme and asked what we could carve for them? After many suggestions, it seemed a Sleigh would fit in well with their Winter Wonderland theme. A Christmas Sleigh is what we carved for them. 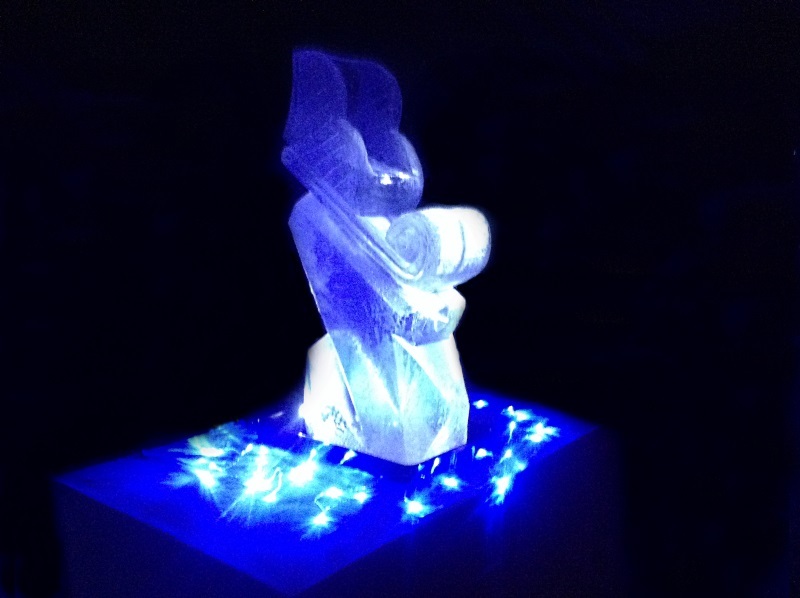 Lighting-wise, we supplied bright white LED lighting which lit up the luge which was just perect and in-keeping as it focussed on the design of the Sleigh and added an impressiveness of the sculpture. The whole area was bathed in a blue, winter-like lighting that really set the scene. This additional lighting turned a spectacular Luge into a phenomenal centre piece to the whole room. The Sleigh Vodka Luge stood an awesome 1m tall and 1/2m wide. Placed on a table infront of all the dining tables, it certainly was well placed to be a focal point, a talking point and set the tone for the whole party. At the opposite end of the room was the band, DJ and dance floor. Those that wanted to dance could at one end and those that wanted to play and have fun with the the Sleigh Vodka Luge could - at the other end of the room. A win win situation for all involved. Like all things, lighting is an improtant factor not only to draw attention to the piece, but to draw people in and get them involved to be part of the party festivities. The blue bathed lighting punctuated with the white LED lighting certainly achieved that goal. Visually this was a spectacular setting and a great success and triumph for Aran.